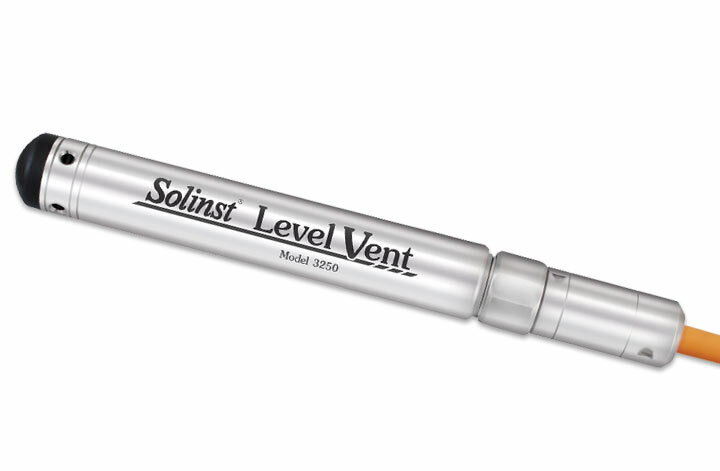 The Model 3250 Solinst LevelVent is a vented version of the much loved Levelogger®. The high accuracy datalogger is suitable for water level and temperature measurement of shallow groundwater. The logger has inbuilt memory for up to 120,000 data logs and a 10-year battery life (based on 1 reading a minute). The LevelVent is available in 5m, 10m and 20m ranges with custom cable lengths up to 152 m (500 ft). Aquifer characterization: slug tests, pumping tests etc. How can I connect my leveloggers to telemetry on the internet? Water level data from remote Leveloggers can be sent using the model 9500 LevelSender, which uses a GSM cellular modem to send the data to a home computer station or mobile device via email/SMS. How do I set up a LevelSender with a Levelogger? Leveloggers are connected to LevelSenders using a Reader cable which connects to the Levelogger’s Direct Read Cable. This can be done by removing the black dust cap from the LevelSender, lining up the holes and pushing the Reader Cable connector into the LevelSender connection and screwing the Reader Cable into the connection on the LevelSender until tight. Then connect the other end of the reader cable to the top end of the Levelogger’s direct read cable. Can I recover old logs? Within the diagnostic utility there is an option called ‘read memory dump’ this will access previous logs from a backup location. This dumps all of the Leveloggers memory into a .xle file. What connection accessories are needed connect devices to the Solinst Levelogger app? Direct Read Cable, clients use this option to suspend dataloggers in the field when they wish to communicate downhole. When working with Leveloggers that are suspended from wireline, or cord, the units must be removed from the well and connected to either a Direct Read Cable (as above) or an Optical Adaptor. For the LevelVent, just connect to the unit via the Vented Cable and LevelVent Wellhead that all units are suspended from in the field – no other connection accessories are required. The AquaVent communication connection is made from the App Interface to the AquaVent Wellhead using an App Connector Cable that is ordered separately. How does the levelogger app interface work? The Levelogger App Interface is portable hardware that connects to the top of your Levelogger via a Direct Read Cable/Adaptor, to a LevelVent Wellhead, or to an AquaVent Wellhead cable. Bluetooth wireless technology allows communication between the Levelogger App Interface and the smart device with the app installed. It allows viewing/downloading of data, and programming of Solinst dataloggers, as well as many other features. Which dataloggers can be used with the Solinst levelogger app? Solinst offers a wide range of dataloggers that can be used with the Leveloggger App Interface. They include the complete, current Levelogger Edge range of units (Edge, Junior Edge, LTC Edge, Rainlogger Edge), previous Gold Leveloggers/Barologgers, and the latest vented datalogger editions, the AquaVent and LevelVent. What functions can the Solinst Levelogger app and interface perform? Program and start dataloggers in the field. Simplify data management in the field by transporting and using less equipment. Download and e-mail logged data files.